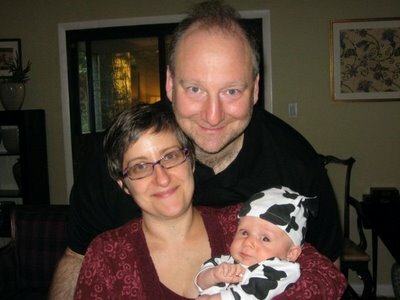 Yonked :: Diary of a New Home: Why is it so hard to blog with a baby crying on your shoulder? Why is it so hard to blog with a baby crying on your shoulder? I admit that we've been very derelict in our blogging. I could say that's because we are spending all of our time taking care of the baby, but that's not 100% true. Most of the time we are staring at the baby and wondering how in the world it is possible that we made something that cute? The rest of the time we are photographing him-- usually the same picture of him asleep or smiling at us. Overall we are too busy loving him to pieces to actually write about him-- or our house, the fence that we haven't put in, the dogs that continue to poop on our lawn/sidewalk/whatever, and our new large-screen tv that is mounted on the wall (right now the major problem is that you can see it when it's on from outside (there's a window on the stairway almost directly across) We need to put some kind of curtain on it-- but the molding on the inside isn't really designed for a curtain. We promise that we will eventually be more punctual in our updating. In the meantime Happy Thanksgiving, and enjoy these two Halloween photos. Yes he went as a cow. 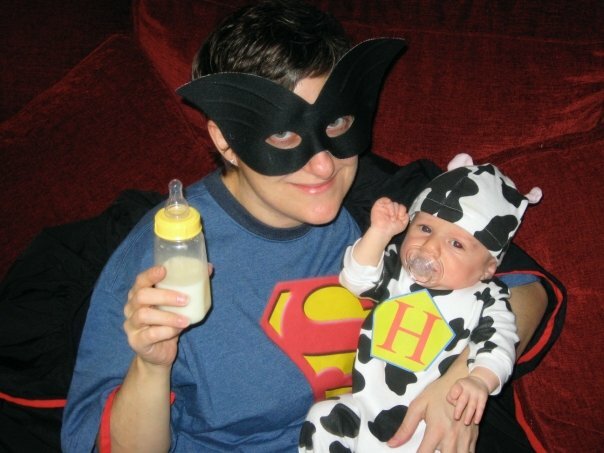 SUPERMOM & HEIFERBOY: MAKING MILK TO SAVE AMERICA! Comments on "Why is it so hard to blog with a baby crying on your shoulder?"